I found an extremely thick paperback lying near the KitchenAid near the stairs. The spine was broken down the middle from handling and culinary love. (Beware the unbroken cookbook). Tonight, I would make a quiche. 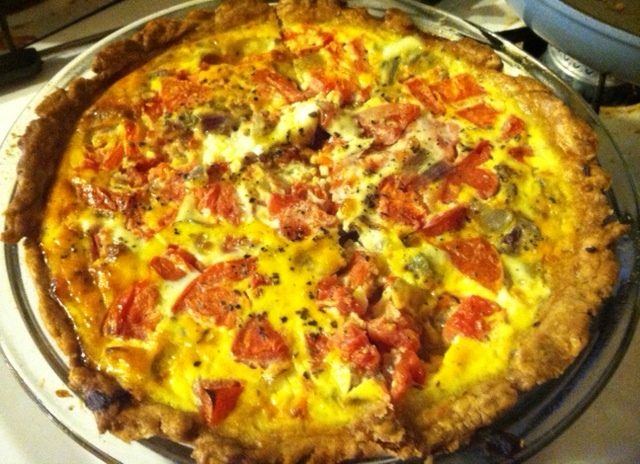 More realistically, tonight I would make the crust of the quiche because I had plans and not enough time. 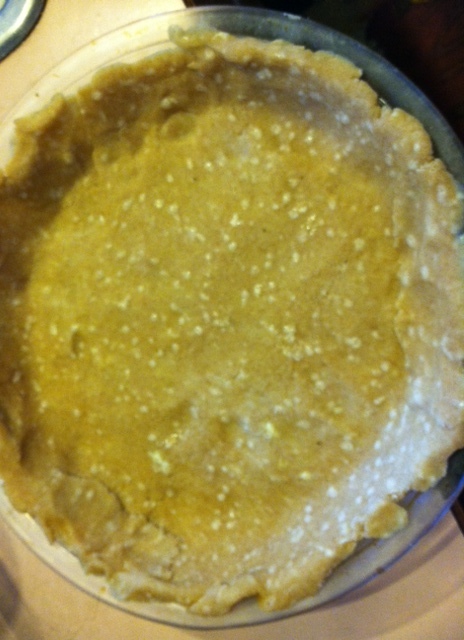 I followed the instructions for a Basic Tart Crust, watched the food processor whir into action and rolled out my buttery masterpiece before sliding it into the refrigerator to cool. When I retrieved the pie dish the following evening, my heart sank. My crust, the first I’d ever made, was covered in white spots. Flecks of butter like pimples on picture day had appeared over night. It looked diseased. “Eh, I’m sure it’s fine. Cook it anyway and see what happens.” That was my mother. Half the recipes I found told me to pre-cook my crust and layer the cheese on the bottom. The other half didn’t pre-cook their crust at all and added their cheesy goodness right in with the rest. I followed the first advice because seeing my infected crust another minute would have forced me to abandon the project and order pizza. After 10 minutes in the oven, the crust had begun to look better and I felt a renewed sense of hope. So I flew into a frenzy, sautéing some onion and green pepper, shredding cheddar and Parmesan, and whipping together as many eggs as I could find. A juicy red tomato on the counter looked lonely so I cut him up too. My knife’s eye turned out to be bigger than my crust’s stomach. My tomato, sautéed ingredients, egg-and-milk liquid, and cheese overwhelmed the small dish. I slid the overflowing mixture into the oven, closed the door and checked my watch. IT WAS DELICIOUS! I beamed at the beautiful egg-based pastry sitting before me and wondered why it had seemed so daunting just an hour before. My pie in the sky became a quiche at the table and I couldn’t have been more proud or relieved. There was no telling what culinary feats I had yet to accomplish. So why write about a simple cooking experience? Why tell you about a seemingly insignificant event in my life? Because that quiche represented something more. I could have baked anything, followed any number of recipes to create a meal. Even the greatest chef can’t promise with 100% certainty that she will open the oven door to find something worth eating. But we go on cooking just the same. I followed pieces of countless recipes, each with a different spice and specific procedure. In the end, you cannot follow anyone’s recipe but your own and that has made all the difference. And by difference I mean quiche. Bon appetite! I remember the first time I cooked a chicken in my new apartment, all by myself! (Don’t we feel like children when we master a cooking project?) It was one of the most delicious chickens I ever remember! Such great memories and what a confidence builder to novice chefs. 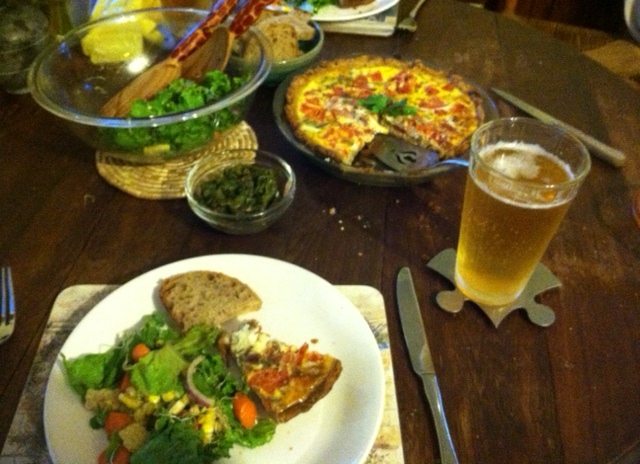 PS- Your quiche looks delicious, too!